Spring is in full swing in the Austrian Alps. 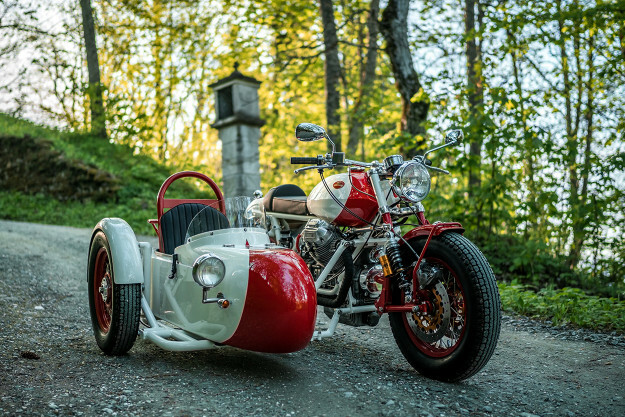 And we can’t think of a more stylish way to wander around the mountains than from the saddle of a classic sidecar. 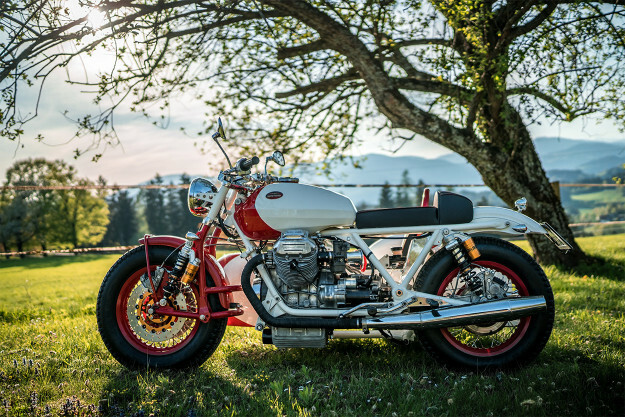 Sidecars are inherently charming, but this Moto Guzzi 850 T3 rig is so evocative, we started scouring the classifieds immediately for a local equivalent. 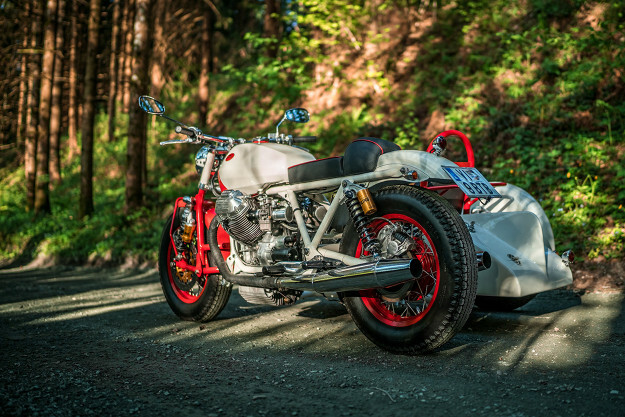 It’s the work of National Custom Tech (or NCT), a young outfit based in the picturesque town of Feldkirchen in Kärnten, nearly two thousand feet above sea level in the eastern Alps. The men behind the company are founder David Widmann, Kurt Kosjek and Manuel Tilke. And old-timers are their specialty. 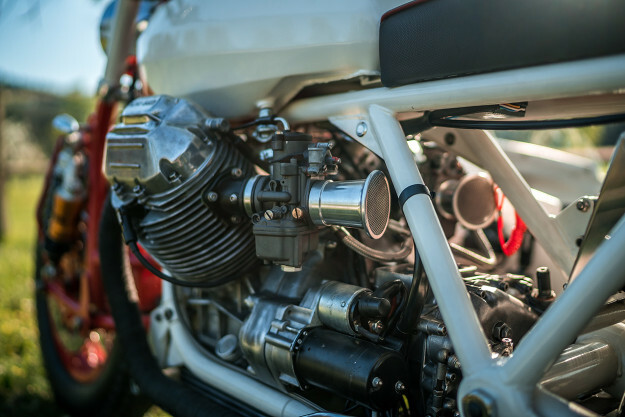 The Guzzi—a 1975 model—had been worked on previously by an outfit called Ivan Bikes, some nine years ago. 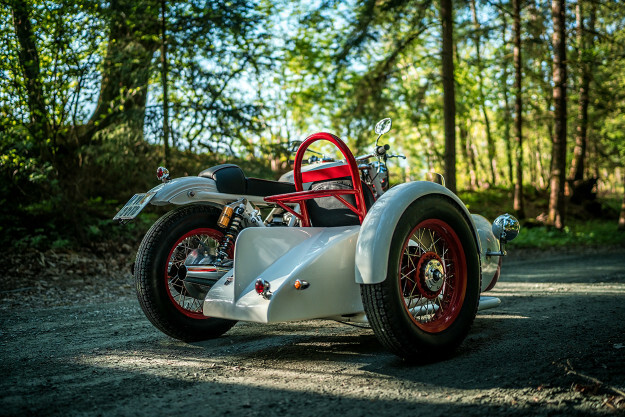 So when NCT got their hands on it, the sidecar hack had already been set up—along with custom-made fenders and an Earles-style front end. Still, that didn’t stop the lads from performing a comprehensive tear down and rebuild. The engine had already been painted black, but the team was after a more vintage effect. So they dismantled it, dry-ice-blasted it, and polished everything up before rebuilding it. Velocity stacks replace the airbox, but NCT opted to retain the original exhausts for the sake of authenticity. Kurt climbed into the wiring, redoing everything with a new battery and a Motogadget m-Unit controller. Great care was taken to hide away as much of the loom as possible under the seat and tank. 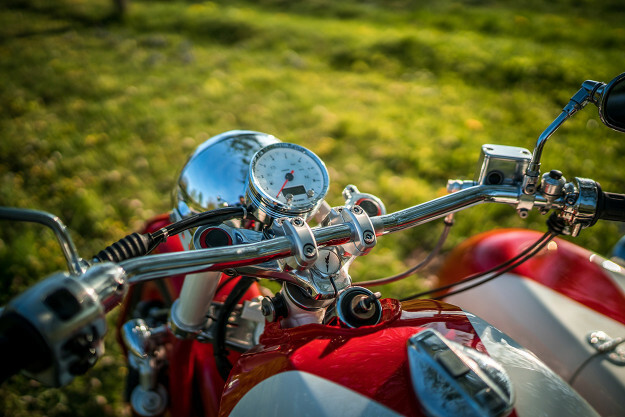 The headlight is still the original unit (mounted on custom brackets), but the taillight, turn signals and Acewell speedo are all new. NCT left the chassis mostly as-is, but added a couple of period-incorrect upgrades. 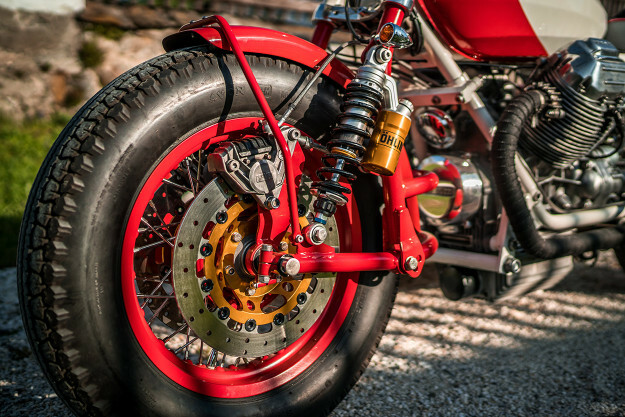 Both ends have been treated to Öhlins suspension and Brembo disc brakes, along with braided brake lines. 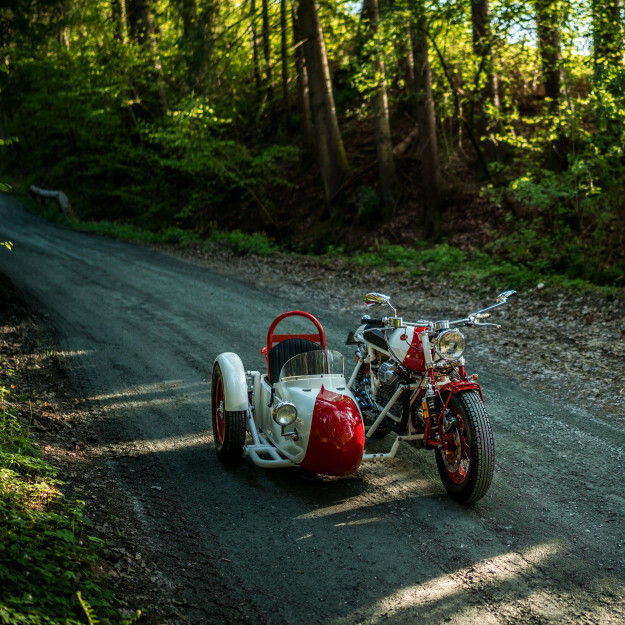 Restoring the sidecar itself turned out to be as much of a chore. For starters, the guys had a ton of holes to fill before they could prep it for paint. There’s a new, custom-made carrier rack out back too, and a smaller windshield at the front. 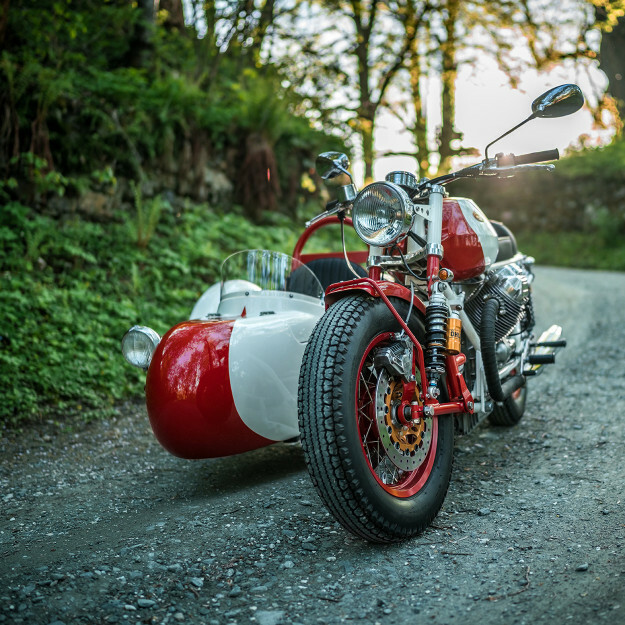 Both the sidecar and the bike’s seats were recovered in matching fabric. 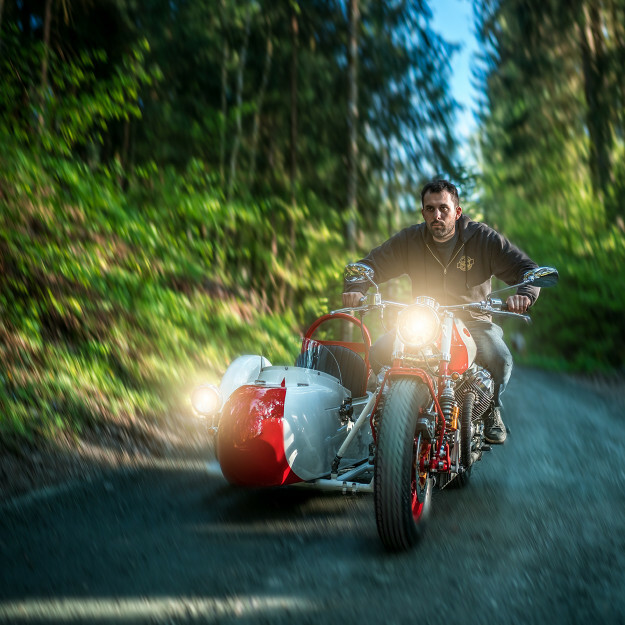 The sidecar was finished off with its own chrome spotlight, turn signals and taillight. Once every single nut and bolt had been seen too, Manuel got busy on the paint. The result is a gorgeous and timeless red and white scheme, with the frame and the wheels powder coated to match. It took the team months to complete the project, but in the end their hard work paid off. The Guzzi’s now with its owner, who’ll be using it to explore Carinthia with his wife (or some extra luggage) by his side. Now where did we put our open face helmets and aviator goggles?